Discover the magical treasures lying deep within the Gringotts vaults. See actual costumes and props from all eight Harry Potter™ films. Warner Bros. Studio Tour London is a truly incredible experience, offering you the chance to explore the grand sets, intricate details and sheer filmmaking magic of the Harry Potter film series. Start the experience where the story begins, at the Cupboard Under the Stairs where Harry spent his days with the Dursleys. After you watch a welcome video, proceed to the Great Hall where you can see actual costumes and props from the film series, in the actual set where Harry and his classmates gathered on so many occasions. Showcasing the best of British filmmaking, the level of detail you come across as you explore the Studio Tour is hard to believe. See the Gryffindor™ common room, visit Dumbledore’s office, peer into Hagrid’s hut and see the incredible animatronic door to the Chamber of Secrets. Ride a broomstick in the green screen experience, step onto Platform 9¾ and see inside the Hogwarts Express. In the backlot, visitors can buy a famous Butterbeer™, before taking in the impressive sights of the Knight Bus™ and Privet Drive. Learn the secrets and magic of filmmaking, with an exploration into the animatronics and prosthetics used in the film series, as well as concept artwork and a colossal model of Hogwarts™ castle itself. Warner Bros, Studio Tour London is an unforgettable day of wizarding fun for all the family. For the first time, visitors are encouraged to defy Professor Dumbledore’s orders and follow Harry, Ron and Hermione’s footsteps into the Forbidden Forest. Home to Buckbeak the Hippogriff, Aragog the Acromantula and 19 trees each with a diameter of over 12 feet, visitors are invited to walk beneath the giant entwined roots and discover how to control the weather using the same techniques used during filming. A fee is charged for infants aged 3 & 4 for transportation only as they require a seat on the bus. Infants 2 years and under require a ticket although they are free. Entry to Warner Bros. 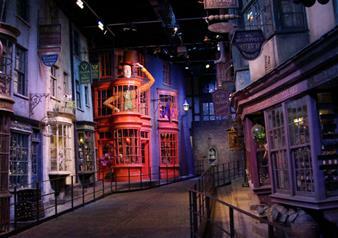 Studio Tour London is free for children 4 years and under. Butterbeer™ may contain nuts and other ingredients that may cause allergies etc.